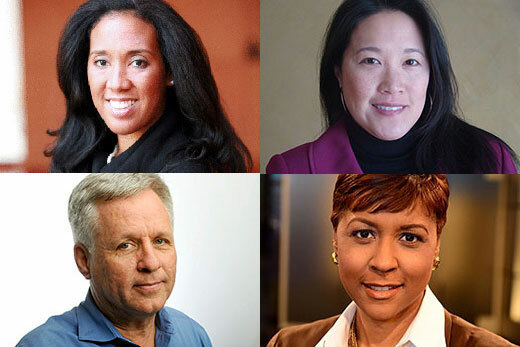 "Fact-checking the Poltical Spin" will feature (clockwise from top left) Andra Gillespie, Emory associate professor of political science; Nancy Leung, senior editor of CNN’s “Reality Check"; Atlanta Business Chronicle broadcast editor Crystal Edmonson; and Jim Tharpe, editor of the Atlanta Journal-Constitution’s PolitFact Georgia. How do the experts wade through the spin and get to the truth during political campaigns? What can the average voter or informed citizen do to determine if political rhetoric is simply that? To shed light on these issues, Emory Libraries will host a panel discussion called “Fact-checking the Political Spin: How the Experts Get at the Truth” on Thursday, Oct. 13, at 6:30 p.m. in the Jones Room at Emory University’s Robert W. Woodruff Library. Jim Tharpe, editor of the Atlanta Journal-Constitution’s PolitFact Georgia. A pre-event reception begins at 6:30 p.m., with the program at 7 p.m. and a post-reception at 8 p.m. Admission is free, but attendees should register in advance. Parking is available in the Fishburne deck. For more information, please email libraryevents@emory.edu or call 404-727-2245.